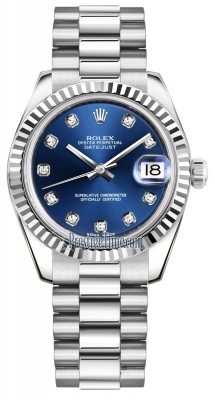 Stamped blue lacquered dial with a "flinque" sunburst textured pattern. Total diamond weight +/- 0.73 carats. Elegant polished white gold leaf shaped & skeletonized hour & minute hands. 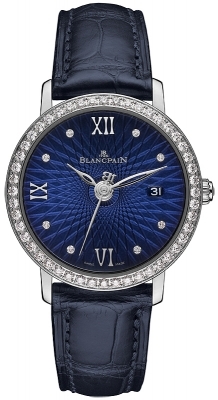 Polished white gold seconds hand with the Blancpain logo at the end. Blancpain Caliber 951, composed out of 174 parts, contains 21 Jewels & has an approximate power reserve of 40 hours.